This high quality Head unit combines Wi-Fi Wireless Streaming, Bluetooth wireless music streaming, call-answering capability into one convenient unit. Built-in Bluetooth and microphone allow you to enjoy hands-free calling and add another level of safety while on the road. Either you're a professional driver that owns a truck, bus or van or just somebody that has a car or an RV, our fully complete dashboard entertainment system with back up camera set will become your favorite road companion! TRAVEL WITH LUXURY! 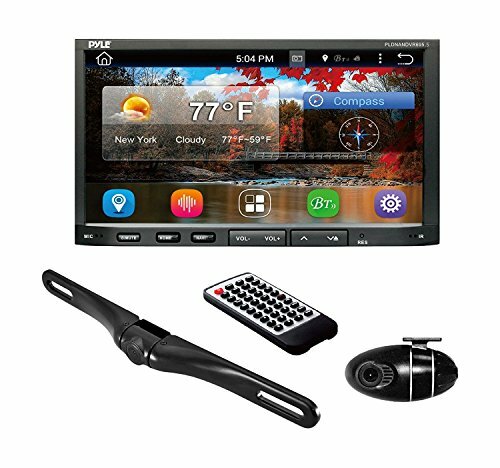 - With this excellent quality Double-Din dashboard stereo entertainment system that lets you make phone calls, stream music with Bluetooth even, and watch videos. No more getting lost on the road thanks to the biult-in GPS. This system also includes an excellent quality dashboard camera that can record many of your on-the-road endeavors and a rearview backup camera that outputs picture on the receiver's display screen! BLUETOOTH CONNECTIVITY: Built-in Bluetooth for Wireless Music Streaming - Built-in Microphone for Hands-Free Calling - Compatible with All of Your Favorite Bluetooth Devices - Digital Phone Dial Pad Display - Bluetooth Version: 2.0 +EDR.